SimBASE® is the new generation Business Process Management System (BPMS) that allows automating the activities of companies having various types and specialisations. The most modern principles of corporate management and motivation are put in the basis of the system business logic, while the technical side is completely based on web technologies. The core of the system is the business processes designer that allows changing the logic of work according to the current needs of the organisation at any time and virtually from anywhere in the world. Business logic level is completely separated from the technical one, allowing both managers and analysts independently control the system behaviour without the help of programmers and developers. The ideology of the system ensures “seamless” implementation of various management and organisational functions, such as electronic document management (including electronic archives), customer relationship management (CRM), quality management and control, incident management, project and service management (including helpdesk and service desk functionality), automated invoicing and team decision-making. Applying principles of a “virtual conveyor” can significantly reduce the time and improve the work quality of all company members by eliminating the need for managers to monitor all the current tasks and assignments, providing them with the relevant information only when the decision needs to be made or a specific action must be taken. System ensures close monitoring of execution for every single business process, immediately informing about any deviation from the regulations, automatically starting problem escalation procedure or emergency recovery scenario. Flexibility. Any business process in the system can be changed at any time, without the need of software reinstallation or re-training of the personnel. We live in a dynamic world and our success depends on our ability to quickly adapt to changes in the environment around us. Security. No loss of documents and important information, no forgotten letters or unpaid bills, no thefts of information from computers of employees and no business interruption due to the hard disk failure. All your techniques and technologies, documents, contacts, history of customer relations, your operation statistics and trace of completed tasks do not get sick, do not go on holiday and do not leave the job. SimBASE® provides comprehensive business security besides the ordinary data encryption, access control and multi-factor authentication. Control. The system provides monitoring of all business processes inside the organisation, measuring of performance indicators and submitting relevant information to those who need it, and only when it does require attention. Errors can lead to losses and SimBASE® system reduces the risk of loss ensuring timely problem discovery and in some cases undertaking automatic correction activities. Organisations of any type that wish to have a powerful and universal tool for further development. In the meantime SimBASE® system is being successfully used both by dynamic private companies and by government institutions with strict regulation of all internal processes and procedures. 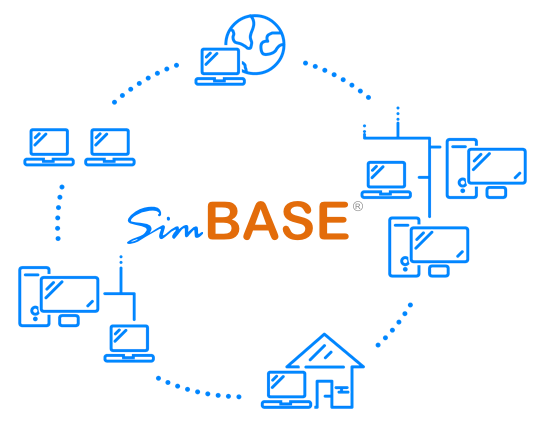 Please contact us, we at Simourg Limited and all our partners are happy to answer your questions and provide all necessary information about the SimBASE® system.